I kind of dreamed this up sometime a couple weeks ago. Pistachio and Rosewater are big in my culture, the kinds of ingredients that permeate my childhood. You can buy Rosewater pretty much anywhere, although I usually get mine at the local Iranian market. A little bit goes a LONG way, so don't get carried away. Pistachio flour is something I recently discovered - if your local specialty market doesn't sell it, then just take a whole bunch of pistachios, soak them in water for a little while if they're salted, and then grind in the food processor. Don't stress! Mix all of the ingredients together with your hands until doughy and sticky. 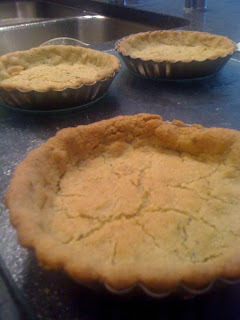 Take some small tartlet pans - mine are from Daiso as per usual with my awesome cooking supplies these days (www.daiso-sangyo.co.jp/english/about) - can't beat $1.50 each! - spread the dough in the tartlet pans, cover with plastic wrap, put in the fridge for at least an hour. 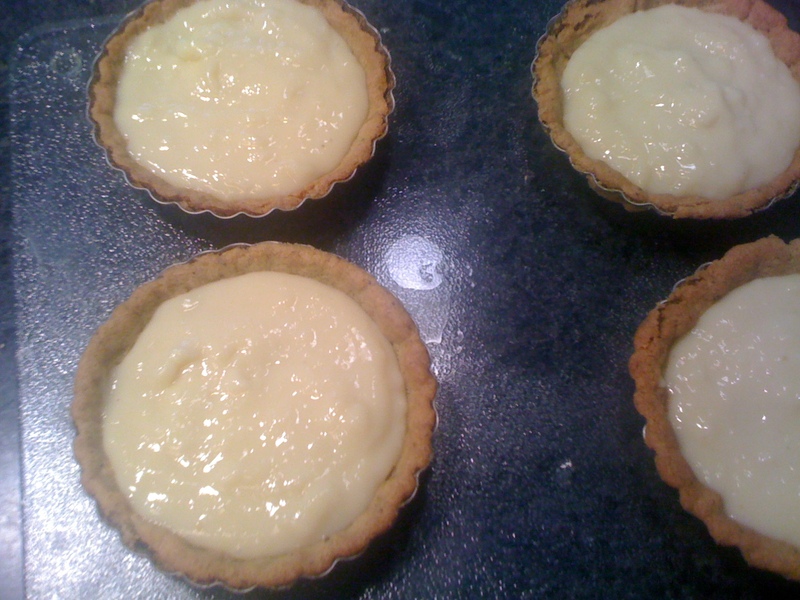 Preheat the oven to 350 degrees F. Bake tartlet for 20 minutes. They are going to puff up and look like cake, but don't worry - they'll collapse seconds after being taken out of the oven. Let cool. I'm sure there is a classier, smoother way about this. In fact - I'm positive there is because when I made lemon curd, I was completely aware of how great a sieve makes curd/custard look. Glassy and all. But. I'm lazy, and it's like 100 degrees in Seattle today, so the less time over the stove, the better. I took all the ingredients (except vanilla and rose water) and dumped them in a saucepan, stirring constantly over heat until it became custard-like in texture. Then I pulled it off the stove, added vanilla and rose water. What you should do, but I didn't, is cover with plastic wrap and put in the fridge so it doesn't get skin. I didn't. I got skin. I discarded. Life went on, shockingly. Spoon custard into tartlet crusts...voila! you are so right. genius. ohhh yummy yummy! I know I've said it before, but I love your flavours. MMMMMMMMMM..